The author admiringly narrates the struggles and difficulties of suffering from Friedreich Ataxia in his inspiring and encouraging autobiography titled “Everyone Needs to Be Heard!” He emphasizes how his faith in God played a huge role in his journey so far. Eric Stratton shows us how his faith in God brought him through the devastating effects of his horrid disease. At the age of sixteen, Eric Stratton was diagnosed with a rare neurological disease called Friedreich Ataxia. It is a condition that brings a progressive damage to the nervous system and causes mobility problems. While faced many great challenges with dealing with this impairment but over time, his faith grew stronger. This is why his journey inspired him to write down his own story to share with the world. 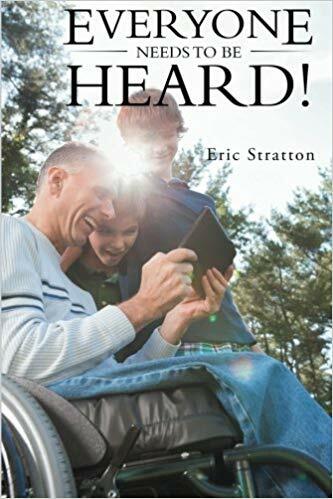 In “Everyone Needs to Be Heard!,” Stratton hopes that his readers will be inspired to never give up, to overcome every challenge in life, and to keep holding on. Through his inspiring story, he also wishes to spread more awareness about the nature and struggles of his rare condition. He sheds light on how his faith kept him going through the devastating effects of the disease. Most of all, he writes his own journey to show that each person’s struggle deserves to be heard. Stratton’s heartfelt and encouraging story will take part in the upcoming 2018 Frankfurt International Book Fair. Happening this October 10-14, 2018, this book will be on the bookshelves to the world’s largest trade fair for books. Be sure to check it out! Eric Stratton was born in southern New Jersey and was raised in the church where he serves as Deacon. He was also a very good tennis player growing up. But by the age of sixteen, he was stricken with neurological impairment diagnosed as Friedreich Ataxia. He shows that without his strong faith in God, through Jesus Christ, his road would have traveled in a different direction.